Is this what a human rights activist looks like? A person capitalizing on the suffering and victimization of the Palestinian population to garner votes? Jagmeet Singh has been enjoying a great run in the NDP leadership race. His polished youthfulness has enabled him to reach out to, and engage with, a wide array of communities with an equally wide range of talking points. This has made him the candidate of choice for many. One of these talking points has been Jagmeet's relentless support of Palestinian rights. New Democratic Party federal leadership candidate Jagmeet Singh speaks a meet and greet event in Hamilton, Ont., July 17, 2017. Last December, he stood out as the only voice of opposition at Queen's Park in the face of a motion aimed at rejecting BDS. The motion, which passed with the support of the Conservatives and Liberals, was aimed at rejecting "the differential treatment of Israel, including the boycott, divestment and sanctions movement." Speaking there, Jagmeet stated that "we cannot support a motion that in effect bans the right to dissent. That is one of the most fundamental rights in any society the right to criticize... is something we must protect. We can't conflate anti-Semitism with a movement that seeks to influence a government to change its course of action." This rhetoric is in line with the overall NDP stance, but has, in the context of this leadership race, earned Jagmeet the image of a campaigner for Palestinian rights. Enough so that he has been given a grade of A- from Canadians for Justice and Peace in the Middle East who have questioned all NDP leadership candidates, placing Jagmeet second to Niki Ashton. 3 yrs ago today the 2014 Gaza War made headlines when 4 Palestinian boys were killed by an Israeli military strike while playing on a beach. However, Jagmeet's criticism remains isolated externally. When it comes to the NDP's own history with Palestinian rights and previous suppression of candidates who were vocally anti-occupation, Jagmeet has yet to take a stance. Most recently, he has accepted the endorsement of Helene Laverdière. Earlier this year, Laverdière, who is the NDP's foreign affairs critic, accepted an expense-paid trip to the U.S. to speak at a conference held by the American Israel Public Affairs Committee — America's largest Israeli lobby. But it would seem that it's not only Laverdière who may be accepting Israeli lobby money to travel. 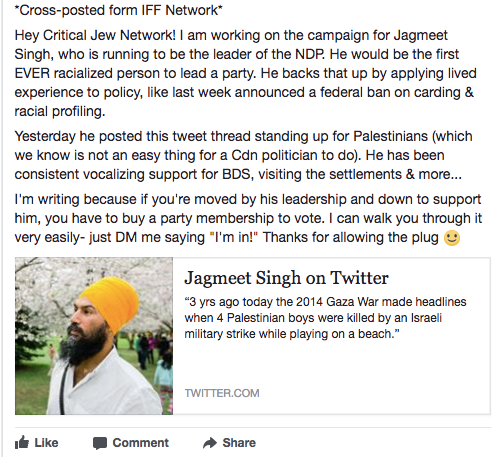 Jagmeet's tweets claim that his trip to Israel and the Palestinian Territories was in December; however, evidence would suggest that his trip took place in January 2017, a month after his impassioned speech on BDS. These media clippings, articles and tweets coincidentally seem to suggest that Jagmeet visited Israel and the Palestinian Territories as part of a seven-member MPP team that included Todd Smith (PC) and Michael Harris (PC), and that his trip may even have been sponsored by no other than the Centre for Israel and Jewish Affairs (CIJA). If this is indeed the trip Jagmeet was referring to in his tweets, it would've been a trip aimed at showcasing a specific narrative with minimal exposure to "the frustrating conditions" of occupation mentioned in his tweets. It's possible the trip would not have allowed him to speak to stakeholders unless they were approved by the Israeli government, and certainly would not have given him the understanding he claims to have of the suffering of the Palestinian people. With all of this, it's important to separate the facts from fiction. 1. Jagmeet has never endorsed the BDS movement, but has only spoken of its right to exist; that is, the right to free expression. 2. Jagmeet has never discussed the NDP's previous conduct against its own members and candidates who have expressed anti-occupation views. 3. Jagmeet has gladly accepted the endorsement of an MP that has been associated with the AIPAC movement and has, without criticism, held onto the NDP's current stance on the Israeli–Palestinian conflict. 4. After making his speech against the anti-BDS motion, it would seem that Jagmeet accepted a CIJA-sponsored tour of Israel and is now using that trip to relay parables of his understanding of the suffering of the Palestinian people. The Palestinian people have suffered enough and deserve more than having their cause and fight reduced to an empty talking point. There is something queasily abhorrent around the thought of Jagmeet and his team using a potentially lobby-sponsored trip to garner the support of voters who have been the direct victims of a sustained occupation dating back to 1948 and their sympathizers. Is this what a human rights activist looks like? A person capitalizing on the suffering and victimization of the Palestinian population to garner votes? Is this what we want the leader of the NDP to look like? If Jagmeet was the activist he claims to be, he would have refused a trip to Israel, a trip he took with an ease unavailable to the more than 6-million Palestinian refugees living outside of Palestine — Palestinians who have been expelled, and remain expelled, by the government that so graciously welcomed him. It's strange to write a piece hoping that your findings are wrong. But if I'm right, it would point to an indefensible, petty and damning manoeuvre beyond any sort of political "bending of the truth." Jagmeet Singh must come forward and clarify the facts. The Palestinian people have suffered enough and deserve more than having their cause and fight reduced to an empty talking point used to mislead the public.